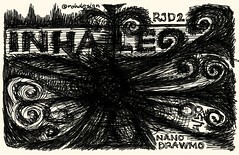 Back in November 2009 I took on the NaNoDrawMo 2009 challenge — creating 50 drawings in the month of November. I found it fun to do, fun to share and a good discipline for me to draw intentionally every day. I've decided to take the challenge again, and promote it here and on Twitter, so others can join in and enjoy the challenge. It's a pretty simple: create 50 drawings between Monday, November 1st and Tuesday, November 30th. Submit them to the NaNoDrawMo Flickr group, and post them on your own site and on Twitter, if you like. 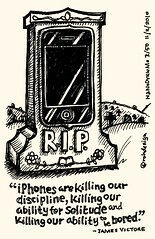 Tweeting photos or a link to your drawing, with the hash tag #NaNoDrawMo helps share your journey with your followers. Plus, those tweets are captured in the Twitter search feed for #NaNoDrawMo which you can search to find the latest entries. Last year my drawings were pretty random, based on whatever struck me at the time. I enjoyed the random approach, though I'd love to tie 50 drawings together in a unified story, revealed a day at a time. I just need to figure out a storyline. I may or may not do sketchnotes this year. I'm tempted to go in a different direction and use my thick Faber-Castell pencil for a little looser feel. I'll make that decision on Monday. Last year's experience taught me to create 2 drawings per day, otherwise you might be up all night on November 30th trying to meet the quota. 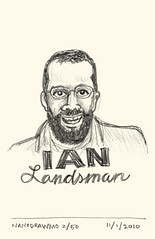 I'd love to have you along for the NaNoDrawMo journey this year. If you're giving it a go with me, leave a note in the comments and be sure to post a link to your Flickr page or website so others can enjoy your work. I'm In Mike! I had not remembered that it was next month; thanks for tweeting it this morning. Really looking forward to it this year. Greg, glad to share the news - looking forward to seeing what you come up with this month! I received your Nanodraw newsletter but for some reason the font does not display properly in Outlook 2010. I can email you a screenshot if this is helpful. Wayne, please do drop me an email - thanks! Saw this on twitter - count me in! 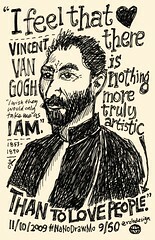 I'll be working on self portraits. Great - glad to have you part of the fun Elizabeth! 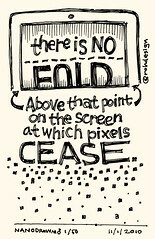 Hey, thanks for doing such a nice "about NaNoDrawMo" page! We totally needed it - this will make it much easier to spread the word. I am going to do this. I also am going to have my two daughters join in. November 1, 2010 | Curtis Gibeaut Jr.